The Cosmic Infrared Background ExpeRiment (CIBER) is a rocket-borne instrument that will probe the absolute spectrum and spatial anisotropy of the extragalactic Infraeed Background (EBL) in a search for signatures from first-light galaxies. 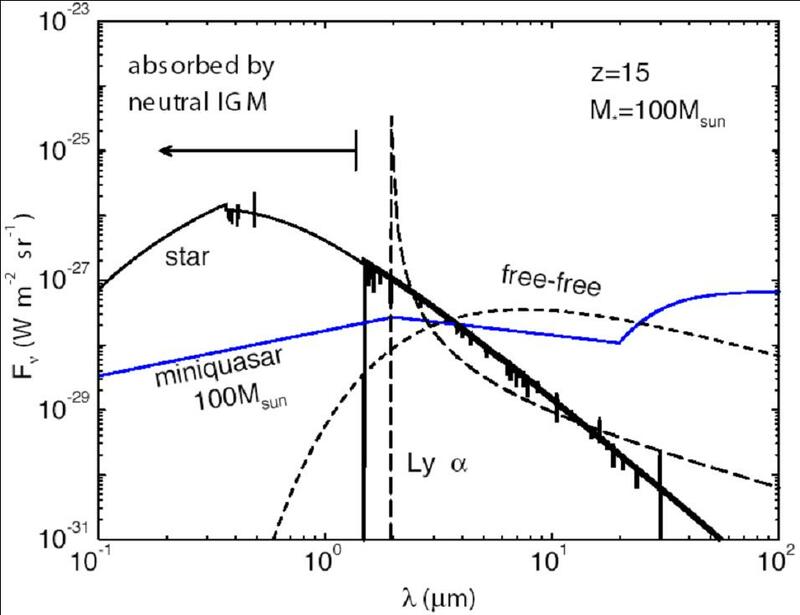 Ionizing sources at high redshift (8 < z < 15) generically imprint a distinctive Lyman-cutoff feature and a unique spatial anisotropy signature to the EBL, both of which may be detectable in a short rocket flight. CIBER consists of a two-color wide-field imager to probe first-light galaxy EBL anisotropies; a high-resolution narrow-band spectrometer to determine the absolute zodiacal foreground brightness using the reflected intensity of the 854.2 nm Ca II Fraunhofer line; and a low-resolution absolute near-infrared spectrometer to search for a redshifted Lyman limit feature in the spectral region between 0.8 – 2.0 μm. CIBER will answer three main questions: Is the background reported by IRTS real? 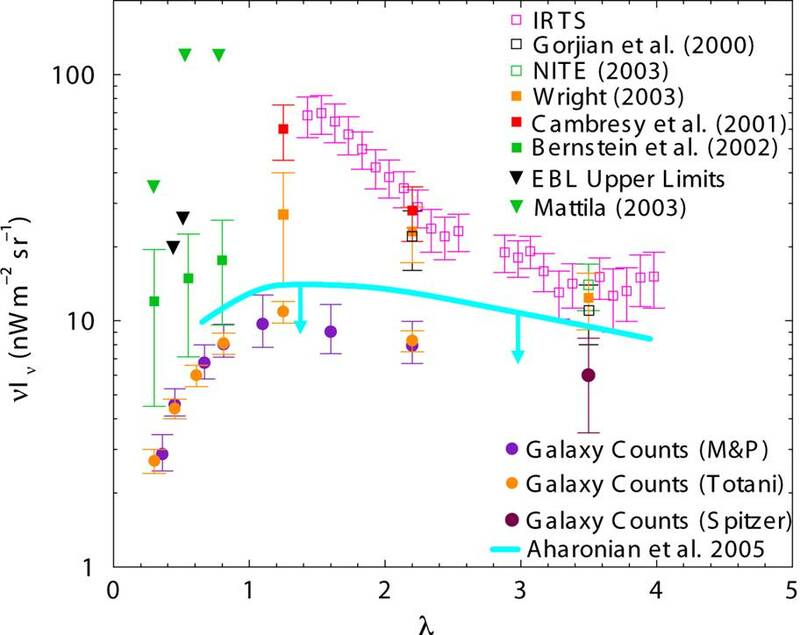 If the IRTS reported background is not real, then is there a detectable diffuse extragalactic background from the first stars? And, is there a Lyman cutoff feature around 1 μm? CIBER will conduct a pioneering search for EBL anisotropies, and is specifically designed to measure fluctuations at wavelengths and spatial scales where a putative first-light galaxy signal can be best detected and discriminated from foregrounds. No current experiment, such as Spitzer or Akari (formerly ASTRO-F), covers these large angular scales or measures in these key wavelength bands. CIBER will be able to either confirm or refute the recent detection of EBL anisotropies in Spitzer IRAC at 3.6 μm and Akari at 2.4 μm, ascribed to infrared emission from clustered first-light galaxies. The spatial power spectrum of first-light galaxy fluctuations, determined by the dark matter distribution at z ~ 8, peaks at an angular scale of 10 arcmin, and differs significantly from the clustering of "local" z = 1- 3 galaxies. 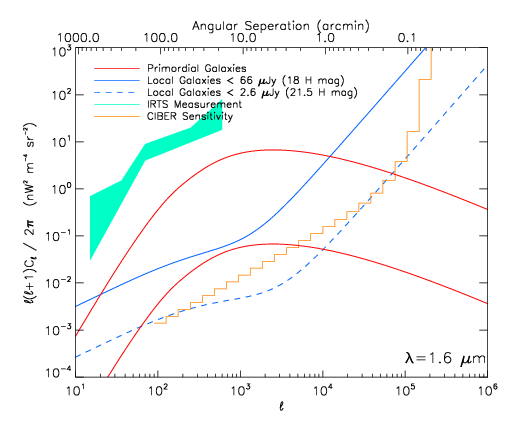 By virtue of its field of view, CIBER covers the most important, and virtually unexplored, large angular scales for probing first-light galaxy fluctuations. The emission spectrum of a 100 solar-mass star at z = 15. In addition to the stellar spectrum (solid line), we also show the nebular Ly-α (long dashed lines) and free-free (short dashed lines) emission of the ionized HII region surrounding the star, where the UV end of the stellarspectrum (thin solid line) ionizes the surrounding medium. Assuming a redshift of formation between 8 < z < 15, first-light galaxy fluctuations will show a distinctive, redshifted Ly-cutoff appearing between 0.8 – 1.5 μm, and an emission peak between 1.1 – 2.0 μm. CIBER probes first-light galaxy fluctuations simultaneously in two bands, 1.6 μm around the expected peak, and 1.1 μm below the cutoff, for a powerful null test. 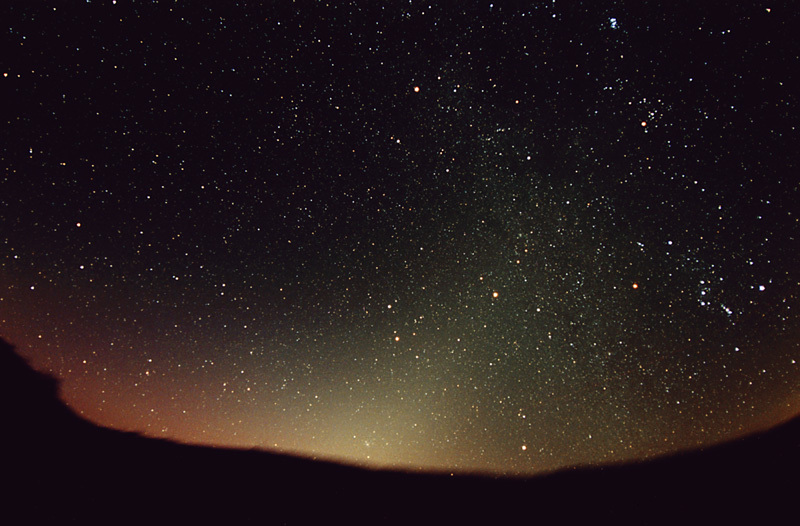 Zodiacal light can be viewed without the aid of a telescope. This photo was taken in the early morning on September 2, 2003, facing east toward the constellation Gemini. The redish haze seen on the left-hand side of the image is auroral glow. A recent upper limit on the near-infrared EBL using TeV blazars disagrees markedly with direct photometry measurements. Photometric background measurements (e.g. DEBLE and IRTS) must accurately measure and subtract zodiacal foreground emission, dominated by sunlight scattered by interplanetary dust particles at near-infrared wavelengths. Disagreements about the zodiacal foreground intensity remain, and the choice of zodiacal model significantly alters the derived extragalactic background intensity, most notably at 1.2 μm. CIBER uses a high resolution spectrometer to measure the intensity of the Ca II 854.2 nm Fraunhofer line in the zodiacal light, and thus directly determines the zodiacal intensity. This measurement serves as an independent check of the DEBLE zodiacal model, upon which all near-infrared absolute background measurements are currently based. Spatial power spectrum of the infrared background in standard IR bands. The deep removal technique virtually eliminates the galaxy foreground signal. Zodiacal fluctuations are negligible, scaling from measurements at 25 μm and 8 μm by the zodiacal spectrum. 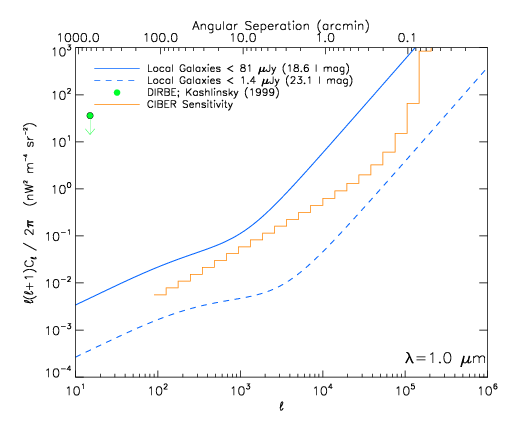 Comparison of the EBL brightness reported by DIRBE, IRTS and HST provides indirect evidence of a significant change in background intensity between 0.8 and 1.25 μm. This apparent drop in the EBL brightness coincides with the red-shifted Ly-cutoff feature from first-light galaxy formation. CIBER will survey the spectrally unexplored 0.8 – 2.0 μm region with the low-resolution absolute spectrometer to search for such a feature. CIBER conducts high sensitivity observations in a short sounding rocket flight, eliminating the atmospheric airglow emission that makes absolute spectroscopy and high-fidelity degree-scale imaging virtually impossible from a ground-based or balloon-borne platform. Unlike existing or planned space-borne facilities, only CIBER incorporates the highly specialized instrumentation needed to carry out these measurements.